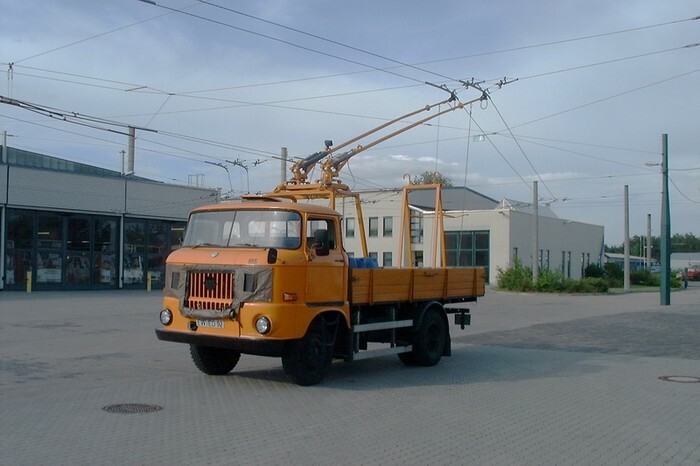 The deicer for the overhead contact line is a truck with an open loading area of the GDR-type IFA W 50 L, which is equipped with a structure. The structure is a self-construction and was built in the workshop of the division IV Personenverkehr (passenger traffic) of the VEB Kraftverkehr Eberswalde for deicing of the overhead contact line. The vehicle was converted from February to May 1991. The structure for the deicer for the overhead contact line consists of two welded racks from metal, which are structured on the loading area of the truck. The front rack takes up the trolley-poles and the rear rack serves for storing for the lowered trolley-poles. At the loading area of the vehicle are further ballast weights made of concrete (approx. 2500 kg) as well as several plastic tanks for the absorption of approximately 300 l snow and ice removal means. In the front rack with the trolley-poles are situated 2 accumulators (12 V, 180 Ah) , which propel a 24V electric motor with coupled impeller pump. The 24V electric motor comes from the articulated trolleybus of the Hungarian type Ikarus 280,93 and was used there as drive for the ventilation of the Choppers (electronic controlling of the drive motor). After approximately one application week the accumulators must be loaded with a battery charger. The front rack is at the foot 1200 mm, at the upper end 750 mm long, 1300 mm broad and has a height of 1650 mm. At this rack from metal is a further metal frame, which is connected with the underframe by 4 insulators. At this framework the mounting plates of the trolley-poles are fastened, again over in each case 4 insulators. These superstructures at the rack from metal are about 500 mm highly. The overall height of the front rack amounts to therefore 2150 mm. The rack from metal was built predominantly from box profiles (65 mm). The trolley-poles however do not serve for current consumption. The end pices of the trolley- poles are equipped with spray nozzles, which are supplied with snow and ice removal means by pump via flexible tubes of plastic from the carried tanks. The flexible tubes of plastic are led through the trolley-poles. The trolley-poles are ŠKODA trolley-poles (one trolley-pole with feathers/springs of the Ikarus 280.93). The end pieces of the trolley-poles are a self-construction according ŠKODA type and they were also used to the trolleybuses of the Ikarus type. At the right trolley-pole in driving direction is installed a halogen headlight. At the rear flap of the open loading area are screwed on two GANZ spring loaded retriever, which draw the derailing trolley-poles during by means of ropes. The trolley-poles are 5500 mm long. The rear rack is likewise a welded construction from metal, which is 2050 mm high, 550 mm long and 800 mm broad. At this rack above two metal hooks for the take-up of the lowered trolley-poles and in the back a cable guide are welded. The vehicle is a 2 axle and has rear-axle drive. The vehicle is not equipped to travel on heavy terrain. The vehicle has two seats. The vehicle is equipped with a yellow warning light as well as with different tools and accessories. The vehicle is equipped with a four stroke Diesel engine with 92 kW performance by 2300 rpm. The four stroke Diesel engine has a capacity of 6530 cm³. The maximum speed is 90 km/h. The vehicle may be equipped with tires of the sizes 8,25-20 12 PR or 8,25 R20 12 PR. The deicer have the registration number BAR-ED 92. The vehicle got the first license on 13 October 1967. 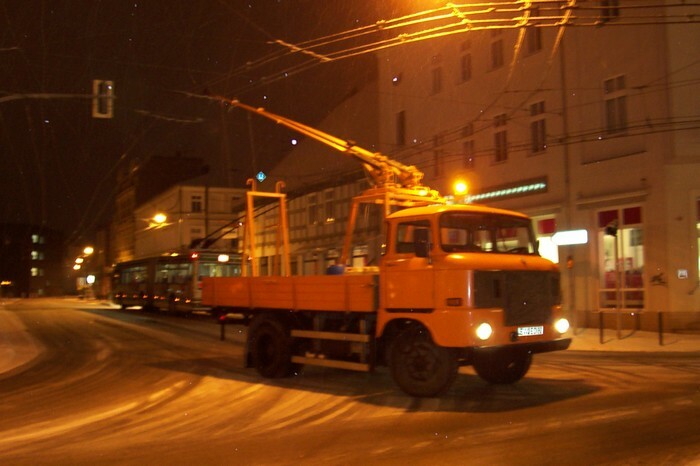 During over frozen wires of the overhead contact line, the vehicle, propelled by its Diesel engine, with it's trolley-poles in contact with the wires, drives along the overhead contact line and sprays the wires with snow and ice removal chemicals. The photo show the deicer of the GDR-type IFA W 50 L for the overhead contact line at depot Eberswalde/Nordend. The photo show the deicer in action at the crossing Breite Straße/Friedrich-Ebert-Straße on 28 January 2005.